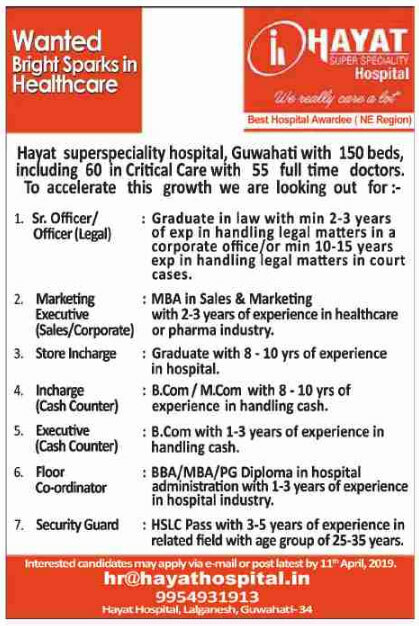 Hayat superspeciality hospital, Guwahati with 150 beds, including 60 in Critical Care with 55 full time doctors. 1. Sr. Officer/Officer (Legal): Graduate in law with min 2-3 years of exp in handing legal matters in a corporate office/or min 10-15 years exp in handling legal matters in court cases. 2. Marketing Executive (Sales/Corporate): MBA in Sales & Marketing with 2-3 years of experience in healthcare or pharma industry. 3. Store Incharge: Graduate with 8-10 yrs of experience in hospital. 4. Incharge (Cash Counter): B.Com/M.Com with 8-10 yrs of experience in handling cash. 5. Executive (Cash Counter): B.Com with 1-3 years of experience in handling cash. 6. Floor Co-ordinator: BBA/MBA/PG Diploma in hospital administration with 1-3 years of experience in hospital industry. 7. Security Guard: HSLC Pass with 3-5 years of experience in related field with age group of 25-35 years. Interested candidates may apply via e-mail or post latest by 11th April, 2019.